1) Trap and remove - effective over the short term, and necessary if squirrels have been sealed inside. 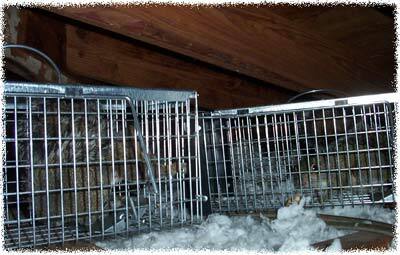 It's best to use smaller squirrel-sized cage traps, as larger cages don't fit well in an attic, and the squirrels can hurt themselves by running around in large cages. 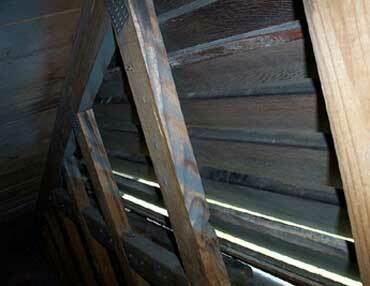 Also, trapping in the attic, such as shown in the below photo, doesn't always work very well. It's better to set traps out on the roof, near the entry points. 2) One-way door - effective if properly installed and if there are no other ways for the squirrels to get back in. This is a great way to get rid of the squirrels in the attic. However, be aware the that squirrels, once blocked out, might chew like crazy to get back in. 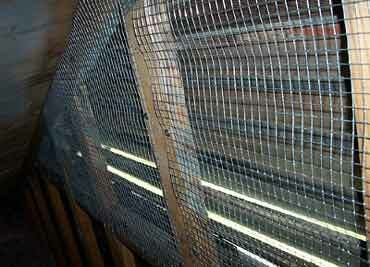 3) Moth balls, ultrasonic sound emitters, sprays, etc - these won't help in the slightest. 1) Squirrels were crawling in and out of this wide open attic vent. 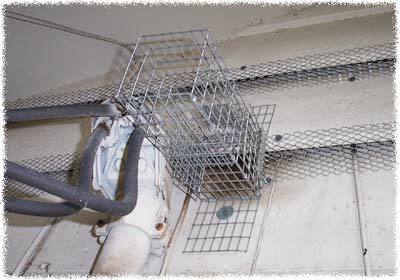 2) I cover the entire vent with heavy gauge wire and bolt it down tight. I identify the attic entry points, trap and remove the squirrels, and seal up every possible way into the attic. For more squirrel control information, go back to the squirrel removal page. Remember, the only way to keep animals out of the attic for good is to identify and seal shut any and all entry points. If you've got an open vent such as the one in the above photo, critters will easily find their way in season after season. Get Rid Of Squirrels In The Attic Having a squirrel in your attic is bad enough, but what if you have several of them up there. It can take days for the average person to get the job done, but if you are trying to get rid of squirrels in the attic here are a few tips that you can use. The first one is to find the location that the squirrels use for entry and make sure that the hole is closed so that other squirrels cannot come in. You should try to scare them out before you plug the hole, but if they remain in the attic then you should go to step two. Step two for getting rid of squirrels in the attic is to place a couple of traps in there so that you can get the little rodents out. The numbers of traps that you will use depends on two factors; the first is the number of squirrels that you have in the attic and the second one depends on how fast you want to get rid of the squirrels. Because the hole is plugged you should not go cheap here. You should try to trap the squirrels as soon as possible because without food and water they will die, and if they do so in a good hiding place then removing them can be more difficult. What Is Some Damage Caused By Squirrels Not all damage caused by squirrels involves electrical wires or broken pipes, although those are probably the most costly repairs for humans. Some damage involves chewing through small openings to make them big enough for the squirrel to get through. If a pregnant squirrel is looking for a home to raise her young, the nest she makes in an attic, for instance, includes whatever is available to her. She will take rags, if she can find any, or insulation and make a nice nest in that. Cardboard or packing materials are also things she can use to make a safe home where she can birth her young. The damage, other than the nest itself, becomes really a serious health hazard to humans when the young are born and urine and feces are littering the attic. It can soak through the sheet rock that makes up the ceiling under the attic. In time, this sheet rock may get so soaked through with urine that it may crash into the room below. There are a number of diseases a squirrel can transmit to humans, such as leptospirosis and salmonella. Lyme disease carrying ticks are parasites squirrels can bring into a home. Of course, rabies, although not very commonly transmitted by squirrels, can be spread by squirrels. Control Red Squirrels In The Attic Red squirrels are of a medium size, weighing about a half pound. They roam around during the day and their favorite food is the seeds of conifers. The best place to find red squirrels is where you have lots of cone-bearing trees, such as pines firs or spruces. If the squirrels you see going into your attic are American red squirrels, you will know them easily by their identifiable reddish coat and white fur down the center of the front of their bodies. It is particularly important to control them and get them out of your attic because of the unusual habits of the mothers to give their young part of their territory. If they are in your attic, one of the young may get your attic as their territory. This will go from generation to generation. When you want to oust your squirrels, make sure the only way they have to escape your attic is by using their exit portal. Then, during the day when they have exited you can cover this last hole. Make sure to check the atiic before you do to make sure it�s clear. When you are sure they have all left the premises, close up the portal with chicken wire.